Why do GOPlins hate the EPA? Paul Krugman says it's all about inequality. Krugman makes the case in his column in the NY Times (reviewed by alternet.org). ... polluters will defend their right to pollute, but why can they count on Republican support? When and why did the Republican Party become the party of pollution? ... Today’s Republican Party is putting a conspiracy theorist who views climate science as a “gigantic hoax” in charge of the Senate’s environment committee. And this isn’t an isolated case. Pollution has become a deeply divisive partisan issue. What happened? Here is Krugman's take. Krugman considers other possible explanations and finds them incomplete at best. Check out his column. Public service post: How strong is your password? Creating strong passwords is a must, but how strong is "strong"? Hackers are pretty good at understanding the psychology of password creation. Here are some tips on what not to do in your defense against the dark arts. ... a growing body of literature reveals that liberals and conservatives think differently from one another in ways that can even be traced back, in part, to the level of instinctual response, reflecting conservatives’ heightened sensitivity to threat bias. This work is congruent with an integrated multi-factor account offered by John Jost and three co-authors in the 2003 meta-analysis “Political Conservatism as Motivated Social Cognition.” In their abstract, they explained, “Analyzing political conservatism as motivated social cognition integrates theories of personality (authoritarianism, dogmatism–intolerance of ambiguity), epistemic and existential needs (for closure, regulatory focus, terror management), and ideological rationalization (social dominance, system justification).” Their meta-analysis integrated findings from 88 sample studies in 12 countries, with 22,818 individual subjects—meaning it drew on a substantial body of work by others. True, we find some support for the traditional “rigidity-of-the-right” hypothesis, but it is also true that liberals could be characterized on the basis of our overall profile as relatively disorganized, indecisive and perhaps overly drawn to ambiguity — all of which may be liabilities in mass politics and other public and professional domains. This statement underscores the point that liberal cognitive tendencies can be as problematic in their way as conservative ones are. But Dems beware: it cuts both ways. On the other hand, they also showed that emphasizing the military’s role in providing equal opportunities for minorities impacts liberals to make them more supportive of the military—so adopting different basic frameworks can reach people on both sides of the ideological divide. Their research doesn’t show that differences are erased, but they can be diminished, which is a start. There is lots more research reviewed here which should be a good starting point for framing messaging for 2016. The confusion in the instructions reported by Lawrence O'Donnell (see my previous post) might very well have been due to a conflict between Missouri state law and a United States Supreme Court ruling. The Supreme Court ruled that force against a fleeing suspect is unconstitutional but Missouri never changed its law to comply. St. Louis Public Radio had two reports, here and here. Just about every news source (e.g., Al Jazeera) reports Darren Wilson's resignation. Here is a claim that he was paid big bucks for the interview with ABC. And we need to learn them because we Dems are already behind -- 2016 started November 5th. There are some good points in this Daily Kos story and I will highlight some of my favorites in snippets here. The Daily Kos post also has links to other good retrospective articles. That is, give the base something to be excited about. Having Dem candidates run/vote as Republican-lite didn't, and won't, cut it. The consequence of that is blurring party identities and a loss of enthusiasm. ... The poll says that people who decided on Election Day, in the final week, and in the final month, all went heavily in the Democratic direction, and that it was the Republican voters who had made up their minds months before. The Washington Post's Aaron Blake has a good explanation for what probably happened here—the decision wasn't between Democrats and Republicans, but between Dems and not voting at all: "Also, it's quite possible those Democratic late-deciders are simply partisans who weren't all that enthusiastic about voting and, thus, didn't technically decide until the very end, even as their votes were basically foregone conclusions." Those numbers sound good from campaign managers' stump speeches. Is there hard evidence of their effect on voter turnout? ... An overview of controlled experiments about GOTV by Vox suggests that even though canvassing is much better at stimulating turnout than, say, mailers or phone calls, canvassing also needs to involve actual good, organic conversations. Simply rushing through the script in order to maximize the number of "knocks" isn't much more effective than forcing people to sit through TV ads. For those who would take issue with this one, I ask that you reflect on what volunteers get asked to do and how that's measured. Consider this parallel. Number of student credit hours is one educational metric used to determine allocation of funds among different university departments. But is that a measure of quality of education? Lesson: It's the REAL economy, stupid. Because what they're doing is working mainly for the economic royalty. The statistic missing from the DCCC flyer about the economy is the decline in real wages even while productivity increased. Lesson: Get a common, gut-level message and stick to it. What was the Democratic theme in 2014? It should have been the economy, stupid. Ed Kilgore looks for a way forward on talking about the economy, not so much a question of "more" or "less" populism but about getting everyone on the same page with one message about the economy, one that focuses on how inequality hampers growth in general. Theres a lot more in this article so have at it. Robert Reich tells a story about the two Americas. Orinda, CA is an upscale, wealthy community that benefits from a good tax base and donations from parents. And it zealously guards its schools. Well, maybe some of the students? Which is why it spends some of its scarce dollars on private detectives to root out children like Vivian. Vivian attends one of Orinda's schools. Why do Orindians want her gone? Here's the story on Vivian. Reich takes Vivian's story to a more general level. And in so doing denies children like Vivian an equal shot at the American dream - a dream that is eroding day by day. Assuring inequality of educational opportunity is one means of reassuring a future in which the rich get richer. Orinda seems posed to create its own border patrol. Is it ready to declare itself the independent state of Orindiana? Lawrence O'Donnell in his "Rewrite": Assistant prosecutors instructed the grand jury with an unconstitutional law. They gave the grand jury copies of a Missouri law that had been ruled unconstitutional by the US Supreme Court in 1985. What did that law say? That police were permitted to use deadly force on a suspect who was running away. And then, when they tried to re-instruct the jury after Wilson's testimony, the prosecutors screwed up the correction. If you read nothing else today, view this video. h/t "Cheri" - a comment in Blog for Arizona. The headline is a play on the famous paper "The Magical Number Seven, Plus or Minus Two: Some Limits on Our Capacity for Processing Information" by George Miller. What is the deal with 108? According to Shaun King writing in the Daily Kos, 108 is the number of days following the shooting of Mike Brown that the Ferguson police claimed Brown had run (and died) 35 feet from Police Officer Darren Wilson. If you make it 118 (the plus 10), the actual distance finally admitted by the prosecutor, Bob McCulloch, was 118+35=153 feet, not 35. Even now, as in the interview with ABC News host George Stephanopoulus, Wilson continues to assert the distance to be 35 feet. Again, Wilson continues to advance the lie because it supports his narrative. If Brown ran half a football field away, it suggests so much more to us than the mental image of his barely making it 10 yards before he, as Wilson suggests, turns around in a demonic rage, and then runs into a hail of gunfire from Wilson's semi-automatic pistol. If Wilson and the police will tell this lie, so boldly and so publicly, we must ask why. If they will tell this lie, one of fact and math, not of opinion, why do they deserve the benefit of the doubt with every other detail they claim to be the truth in this case? Therein lies a limit on belief in our judicial system. Ultimately, this case should've gone to trial, where these claims could be cross-examined and debunked by a truly concerned attorney. But Brown's family, and all citizens who care for justice, were denied this opportunity. Otherwise, the recall effort will kick in during the summer break. See the story by Montini at azcentral.com. Of all the letters she didn't care to have added to her name (like, MS, PhD), I would have thought F would be the least desirable. Maybe not. P. S. She appears to keep dodging reporters so she is getting a zero on the first question of the first Spring semester exam. Link to the story at azcentral.com. And here is another one on Obamacare. Watch their eyes glaze over and heads explode. Here is some culinary advice for next Thanksgiving (or any dinner until then) from Ezra Klein at vox.com. Lawyers for both Barber and McSally campaign are duking it out in court. The judge is expected to rule early next week. Here is the story from Jim Nintzel at Tucson Weekly/The Range. And here is an editorial reaction to which ballots should be counted by Dan Shearer at GV News. Why is Harry Reid Republican-lite? He struck a deal with the Republican House leadership on a tax deal that would scrap the Earned Income Tax Credit and the Child Care Tax Credit while preserving tax breaks for corporations - permanent ones at that. Nancy Pelosi in the House and Sherrod Brown in the Senate are gathering the votes to prevent the override of the veto certain to come from President Obama. So, why IS Harry Reid Republican-lite? More generally, why do Democratic politicians run away from their own party and its values? Here are the details in a report from Daily Kos. P. S. The wind energy tax credit is in that bill and will be collateral damage if a veto is forthcoming. The Congress might still work out a tax package that avoids the veto and some windy-states Senators promise to keep the credit alive. This is what comes of bundling unrelated items into single bills. Here is the report on that bill from motherjones.com. 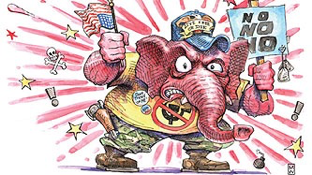 Why is Tea Party blood pressure off the charts? O. B. A. M. A.
Oh man, I can't tell you how much I wish they'd actually take Lowry up on his suggestion. Can you imagine anything that would strike middle America as pettier and more pointlessly vindictive than this? Anything that would seem feebler and more futile? Anything that could possibly be more evocative of a five-year-old throwing a tantrum? I guess you could if you put your mind to it. But it would be hard. Obama is really inside their heads, isn't he? Yes, but it gets even better and closer to home sweet home in crAZy. At the top of [the Tea Party] list of potential targets are politicians like Senator John McCain of Arizona, a proponent of an immigration overhaul. Their fantasy candidate: Sarah Palin, Mr. McCain’s former running mate, who now spends much of the year at her home in Scottsdale, Ariz. Two prominent conservative activists, who spoke anonymously to reveal private discussions, said leading Tea Party figures planned to reach out to Ms. Palin to see if she was interested in running against Mr. McCain. I wonder if ritzy Scottsdale is prepped for drunken brawls. Here are links to two stories about the shooting of the unarmed, black teenager Mike Brown by Police Officer Darren Wilson in Ferguson, Missouri. Both are written by Ezra Klein of vox.com and based on now public accounts. One story is based on testimony of Brown's companion the day of the shooting, Dorian Johnson. The other is based on the statement by Darren Wilson. Klein highlights the notorious unreliability of eye-witness testimony and the fallibility of human memory of rapidly occurring, highly emotional events. As with Wilson, it's impossible to know where Johnson is telling the truth, where he's lying, and where his memory is simply faulty — eyewitness accounts are completely unreliable even under the best of circumstances, and these were not the best of circumstances. But where Wilson's account presents Brown as completely irrational and borderline suicidal, Johnson's account is more recognizable. It isn't a blameless, kindly beat cop who gets set upon by a rampaging Michael Brown. And nor is it a blameless, kindly Michael Brown who gets set upon by a cold-blooded murderer with a badge. It's a cop who feels provoked by these two young black men who won't get out of the street, and who tries to teach them a lesson, to put them in their place. His actions escalate the situation, and then the adrenaline floods, and then there's a struggle, and the situation escalates, and escalates, and escalates, and then Darren Wilson shoots Michael Brown and Michael Brown dies. All this happened in less than two minutes. The fight happened in even less than that. And so there's also room for both accounts to be subjectively right. With the adrenaline pumping Wilson might really have grabbed Brown first, but then thought Brown was trying to grab his gun, or beat him to a pulp, even as he was really trying to get away. Brown might have sworn at the cop who almost clipped him with a truck, but after that, he might have really been trying to simply survive the altercation. In the end we are left with conjectures - "might really have" - that were not put to rest by the grand jury's decision not to indict. My quiz is based on an article in motherjones.com by Andrew Bacevich (see last item in this post for his creds). Considered from this perspective, the "Iraqi government" actually governs, the "Iraqi army" is a nationally representative fighting force, and the "Iraqi people" genuinely see themselves as constituting a community with a shared past and an imaginable future. If you believe that the greatest Humpty Dumpty of all times, Dubbya, broke Iraq with his trumped up invasion, then you most likely answered "no". Another reason for answering in the negative would be recognition of the incompatibility of mid-East boundaries and the actual distribution of religious and cultural groups. Q2: Which of the following assertions (quoted from the Bacevich article) is provably false? (a) The presence of US forces in the Islamic world contributes to regional stability and enhances American influence. (b) The Persian Gulf constitutes a vital US national security interest. (c) Egypt and Saudi Arabia are valued and valuable American allies. (d) The interests of the United States and Israel align. (e) Terrorism poses an existential threat that the United States must defeat. (f) Each of the above is arguably false. (g) Each of the above is true. If you affirmed the truth of one or more of these statements, then there is a place for you in the State Department or Pentagon or Council on Foreign Policy. Bacevich dismantles the rationale for each one of these assertions. Read his essay to find out how. Andrew J. Bacevich, currently Columbia University's George McGovern Fellow, is writing a military history of America's war for the Greater Middle East. A TomDispatch regular, his most recent book is Breach of Trust: How Americans Failed Their Soldiers and Their Country. David Johnson at ourfuture.org (h/t Daily Kos) reacts to a "60 Minutes" report on our crumbling infrastructure. The solution is clear: borrow the money while interest rates are low and then start hiring and rebuilding. The reason why it is not now happening, and may never happen, is simple: Republicans don't want government to succeed. OK, you say, that's too harsh. You may be right. The Republicans might want infrastructure investment but they want more tax breaks for corporations first. Read Johnson's article - it has the link to the 60 Minutes program. House Republicans are pushing a tax bill that chops out extensions of the earned income credit and child tax credit - it's payback for the President's immigration action. Let's see if it hits Obama's desk DOA. The essence follows (from the Kevin Drum article at motherjones.com). ....Left off were the two tax breaks valued most by liberal Democrats: a permanently expanded earned-income credit and a child tax credit for the working poor. Friday night, Republican negotiators announced they would exclude those measures as payback for the president’s executive order on immigration, saying a surge of newly legalized workers would claim the credit, tax aides from both parties said. So there you have it. This bill is the first victim of Republican frothing over Obama's immigration order. As revenge, they left out Democratic tax priorities, and Obama is having none of it. Wages have fallen for non-graduates, but wages for college-educated people have fallen also. Why? ... While a college education is now a prerequisite for joining the middle class, the middle class is in lousy shape. Its share of the total economic pie continues to shrink, while the share going to the very top continues to grow. You can find more dismal statistics and analyses in Reich's essay at alternet.org. Here is a report on how the Ferguson grand jury failure to indict is a statistically significant (meaning rare) event. But if you look at just police shootings, failures to indict are commonplace. The question, raised in the report from fivethirtyeight.com, is why? The release of all the evidence may be enlightening. Here is a post from Steve's Facebook page this last Friday (11/21/2014). This morning I took on Senate President Biggs and House Speaker Gowan debating fiscal policy in front of about 800 corporate tax cut fans at the annual conference of ATRA, the AZ Tax Research Association. I believe I more than held my own. The most astonishing moment came when Sen Biggs told the crowd that a court forcing the legislature to adequately fund our schools would be a "great injustice." Then he said that he was confident we would be done with session, complete with a partisan budget in only 65 days, since he figured The governor, speaker, and he would agree on everything. We have a lot of work to do. I did make headway arguing passionately that our schools are more important to a healthy business climate than yet another corporate tax cut and got some applause. "great injustice"? 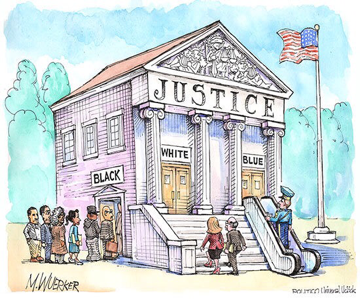 Since when is education an "injustice"? The difference between Republican and Democratic brains is large indeed. IMO, enacting new taxes is not likely. So we need to support Steve in finding revenue sources by closing loopholes. More on that to come. Here are snippets with the essence of the story from azcentral.com. A federal appeals court Monday denied Gov. Jan Brewer's request that it reconsider its ruling blocking her denial of driver's licenses to young undocumented immigrants protected by a 2012 deferred-deportation program. That is, she lost the appeal heard by a 3-judge panel and then asked for the entire court of 11 judges reconsider. Basically they said "no." The ruling affects an estimated 20,000 immigrants in Arizona who are protected by the Obama administration's Deferred Action for Childhood Arrivals, or DACA, policy. The policy allows undocumented immigrants who were brought here as children before June 15, 2007, and who were born after 1981 to be protected from deportation as long as they register and pass criminal-background checks. Brewer issued an executive order denying licenses to DACA recipients on Aug. 15, 2012, the same day DACA took effect. Gov.-elect Doug Ducey has said he will continue Brewer's policy with regard to the driver's licenses. "Clearly, the legal process should play itself out in relation to this matter," said Daniel Scarpinato, Ducey's spokesman. "As the governor-elect has always stated, he will adhere to the law once a final rendering has been reached." So here you have it -- the first concrete action of the incoming Dicey administration on job creation. "Gov. Brewer has wasted countless taxpayer dollars defending a misguided and harmful policy that has been rejected time and time again by the courts," said Dulce Matuz, one of five plaintiffs in the case. It's not a waste. Think of the countless jobs created by this investment of tax payer dollars. Jobs for lawyers, that is. ... to do nothing? The newly elected education superintendent talks crAZy conspiracy theory to the Tea Baggers and ran on one issue - common core. And yet the voters put her in that position (by an overwhelming mandate of 50.48%) for which she is otherwise completely unqualified. Laurie Roberts at azcentral.com reports that there already is a recall effort officially underway. A political committee on Monday filed formal paperwork with the Secretary of State's Office, signaling its campaign to recall Arizona's soon-to-be top educator. The Coalition to Recall Diane Douglas is set up with a phone number, an e-mail address, a Facebook page and a pair of guys who want to see Douglas bounced from the state superintendent's office. However, the actual recall cannot happen until July. Under Arizona law, she gets to serve for six months before she can be recalled, under the enduring principle that our leaders ought to have time to do something silly, scandalous or just plain stupid before we bounce 'em. So says a recent study reported in motherjones.com. Republicans report changes in temperature but then refuse to believe in climate change. Not so with Democrats. You could just as well translate this into economic terms and the belief in trickle-down economics. The GOP members of both chambers, notably Ryan and Hatch, could be on their way to rewriting the rules of mathematics. The basic idea is to make tax cuts for the rich appear to be lest costly than they actually are. If you don't like minus signs in your budgeting, just make the "-" into a "+". If that happens, look for the economic inequality indicators to take off. Read the details in this post at motherjones.com. I suspect that many Green Valley households are in what Bob Lord at Blog for Arizona calls the Affluent 9%. Such households should be worried because the concentration of wealth among very few people threatens them just like it has taken a horrific toll on Americans in the bottom 90% bracket. (Want examples? Google #MyHungerGames.) Here is the danger. The affluent 9 percent are those households with annual incomes roughly between $100,000 and $400,000, the 30 million Americans both affluent enough and numerous enough to maintain our facade of prosperity. They fill our restaurants, populate our shopping malls, and fill the coach sections of commercial airplanes. They trade in their cars before running them into the ground, simultaneously propping up our auto industry and creating a used-car market for those unable to buy new. But that economic group is at risk because of the increasing concentration of income share in the top 1%. Saez and Piketty have tracked the distribution of income in America over a 100-year period. Their data establish a consistent relationship between the income share of the top 10 percent of the population and the shares of the top 1 percent and top 0.1 percent. The top 10 percent’s share of the nation’s income typically matches the top 1 percent’s share of the income that goes to the top 10 percent, and the top 0.1 percent’s share of the top 1 percent income follows this same pattern. Is the pattern a precise relationship? Of course not. We’re not talking immutable laws of physics here. But the pattern has been remarkably consistent over time, with the period between 1931 and 1940 the only substantial aberration. Otherwise, the pattern has held. If 40 percent of the country’s total income is flowing to the top 10 percent, then about 40 percent of that 40 percent, or 16 percent, will be flowing to the top 1 percent, and about 40 percent of that will be flowing to the top 0.1 percent. Consider what happens to the share of the affluent 9 percent under a mathematically precise proportionate sharing pattern as income concentrates at the top. Early on, the income share of the affluent 9% increases. But as the share flowing to the top 1 percent expands, the rate of increase for the affluent 9 percent slows. Eventually, when the share of the top 10 percent hits 50 percent of total income, the income share of the Affluent 9 percent peaks at 25 percent, after which it declines. At this point, the affluent 9 percent transition from being beneficiaries of increasing inequality to being victims. So what will that do? The question may not be how much income we can cram into the top 1 percent, but how long we can sustain the affluent 9 percent while the income share of the top 1 percent soars. If the affluent 9 percent feel pinched and cut back, our consumption-based economy could implode. How close are we? Read Thom Hartmann's book The Crash of 2016. ... while the outcome wasn't quite what I had hoped for, I am pleased that in the face of that rightward headwind blowing across the country we Democrats in the Arizona Senate at least maintained our current membership. Voters have maintained our 17-13 Republican-majority party division as we enter a year that will bring tremendous challenges to keep our state fiscally afloat and schools funded as we face the dual threats of continued economic stagnation and the gaping budget holes left by arbitrary corporate tax giveaways that their proponents promised us would fix the stagnation years ago. There are solutions to these challenges, and I will advocate as hard as I can to enact them. We can finally tackle the revenue hemorrhaging from more than $12 billion in special interest tax loopholes currently in our sales tax code, like the infamous 4" pipe exemption. We can agree to prune back previously enacted corporate tax cuts that are not yet fully phased in, especially given the statistical lack of correlation between absurdly low business taxes and economic growth. AZ Fact Check at The Republic took this claim about tax loopholes on and reports results of their research. The fact is that AZ could be in the black if most of those loopholes were closed. Oh, I can hear the howling start now.